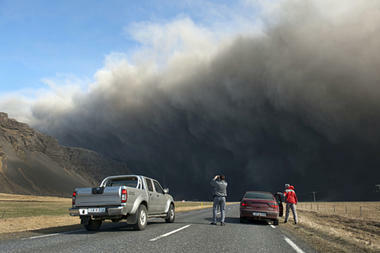 When the Icelandic volcano, Eyjafjallajökull (pronounced AY-ya-fyat-la-yo-kult), erupted on April13th, most researchers were not only calculating the destruction of the single vent, but they were also speculating the probability that another – more immense volcano – was going to blow its lid. Katla, another volcano located only a few miles to the east, has a history of acting up soon after Eyjafjallajökull; scientists are keeping a close monitor on any seismic activity in the area, anticipating historical patterns to reflect on this most recent eruption. Records show that both Eyjafjallajökull and Katla erupted in 1612, 1821, and 1823; while some believe that Eyjafjallajökull also erupted in 920, experts agree that the Largest eruption’s in Iceland’s history arrived only a decade later, between 934 and 940. This eruption began on March 20th, a fissure cracked open on the side of the volcano, sending lava spray into the air that lasted for several weeks. On March 31, a second fissure gaped open, until finally, on April 13th, a slew of minor eartquakes crumbled the south rim of the volcano, collapsing the central chamber, which was directly beneath a glacier. Forty-eight hours later, and the consequential ash plume was large enough to force all air traffic in the United Kingdom to cease. Considering the fact that iceland itself is merely an island-manifestation of a highly active Mid-Atlantic Ridge, where volcanic magma bubbles up between the seam that scars the ocean floor. According to Alan Linde, a seismologist at the Carnegie Institution for Science in Washington, D.C., Iceland offers a great above sea-level view of a diverging sea floor.